Bahrain Center for Human Rights (BCHR) - Defending and promoting human rights in Bahrain. Also see The Blog and Newsletter. Bahrain Independent Commission of Inquiry (BICI) - The Commission was asked to determine whether the events of February and March 2011 (and thereafter) involved violations of international human rights law and norms, and to make the recommendations that it deems appropriate. Read final report here. Bahrain Institute for Rights and Democracy (BIRDBH) - Works alongside NGO coalitions, international bodies, members of the British-Bahraini community, Bahraini activists, and the UK public to raise awareness of the human rights situation in Bahrain. Bahrain News Agency - Official news agency. Bahrain Watch - Research and advocacy organisation that seeks to promote effective, transparent and accountable governance in Bahrain. Hassan Rouhani - Emerged victorious in Iran's 2013 election campaign for President. The 64-year-old cleric is considered a relative moderate, and is best known abroad for his role as Iran's top nuclear negotiator from 2003 to 2005. But he has a long resume of accomplishments as an academic, military commander, longtime parliament deputy, and holder of various high-ranking government posts. He also maintains a Twitter account. Also see Wikipedia. Human Rights Watch: Report on Iran - HRW country report on Iran. Iran National Front/US - Official site. Iran Project - Seeks to improve official contacts between the United States and Iranian governments. The Iran Project was started in 2002 by the United Nations Association of the USA and Rockefeller Brother's Fund. The Iran project has three main objectives: to promote an official U.S.-Iran dialogue, to develop a peaceful resolution to the nuclear standoff, and to encourage greater cooperation between the U.S. and Iran for greater regional stability. Iranian Cultural & Information Center - Iranian culture. Also see maps page. Mahmoud Ahmadinejad - Sixth President of the Islamic Republic of Iran, and the main political leader of the Alliance of Builders of Islamic Iran, a coalition of conservative political groups in the country. ABNA24 - Iranian news agency. AhluBayt News Agency (ABNA.co) - Iranian news agency. FARS News Agency - Iran's leading independent news agency, covering a wide variety of subjects in different, political, economic, cultural, social, legal, sports, military and other areas in Persian and English. Iran Project - Run by a group of Iranians inside and outside of Iran to influence the policy of Iranian government and foreign media to the extent they can. Iran Pulse - News from the Iranian press. Iran Tracker - A selection of the latest news stories and editorials published in Iranian news outlets. Islamic Republic of Iran Broadcasting - Live broadcasts. Islamic Republic News Agency (IRNA) - The official news agency of the Islamic Republic of Iran. It is government-funded and controlled under the Iranian Ministry of Culture and Islamic Guidance. Mehr News Agency (MNA) - An Iranian news agency headquartered in Tehran, owned by the Islamic Ideology Dissemination Organization (IIDO). It transmits news and photos in seven languages of Persian, English, Russian, German, Arabic, Turkish, and Urdu. Pars Times - Information on Iran and the Middle East. Incudes news, business, culture and comprehensive links on Iran Government. Tasnim News Agency - News from Iran and world in politics , economic, social, culture, sports. The Iran Project - Iranian news, analysis. National Iranian American Council (NIAC) - A nonpartisan, nonprofit organization dedicated to advancing the interests of the Iranian-American community. Payvand - Iranian global portal. Race for Iran, The - Presents analyses of Iran and its geopolitics and a a forum for an ongoing conversation about Iran. Seyed Hossein Mousavian - An Iranian policymaker and scholar who has served on Iran's nuclear diplomacy team in negotiations with the EU and International Atomic Energy Agency. He currently resides in the United States, where he is a visiting research scholar at Princeton University. Sayyid Ali Khamenei - Office of the Supreme Leader. The second and current Supreme Leader of Iran and a Muslim cleric. Khamenei is head of state and the most powerful political authority in Iran. Association of Muslim Scholars in Iraq (AMSI) - A group of religious leaders in Iraq. It was formed on the April 14, 2003, four days after the U.S.-led invasion demolished the Ba'athist regime of Saddam Hussein, by a group of scholars who aimed to represent Sunnis in Iraq. Though not a political party, the association is considered to be politically influential. It also administers a charitable fund set up for the upkeep of religious buildings. Also see Wikipedia. Back to Iraq 2.0 - A weblog about Iraq, Kurds and the Middle East. Baghdad Bulletin - Covering the redevelopment of Iraq. Education for Peace in Iraq Center (EPIC) - Works to improve the human condition in Iraq by educating and mobilizing the American public to affect nonviolent social change as well as a shift in US foreign policy. EPIC's goals are carried out through its three main programs: Advocacy, Media, and Iraq Speakers Bureau. Each program uses education to effect nonviolent social change and influence U.S. public opinion and government policy toward Iraq on a national and international level. Human Rights Watch: Report on Iraq and Iraqi Kurdistan - HRW country report on Iraq and Iraqi Kurdistan. Independent, The - An independent, student run newspaper at the American University in Cairo (AUC). Institute of Regional and International Studies (IRIS) - An independent research center housed at the American University of Iraq, Sulaimani. Iraq: Map [.pdf] - United Nations Cartographic Section detailed map of Iraq. Iraq: Map Sources [.pdf] - This CRS report for Congress identifies selected Web sites for maps of Iraq. Selected government, library, and organizational Web site addresses are provided. Maps of the Middle East, Iraq, and the No-Fly Zone are also provided. Iraq Occupation Index - KWSnet: maps, protest and resistance, and background resources to the conflict in Iraq. Iraq Oil Report - News, analysis and insight into developments of Iraq's oil, natural gas, electricity and fuels, as well as the security and politics of Iraq, which are inherently tied to it. Updated Monday through Friday. Iraq Oil Report is written, edited and produced by Ben Lando. Iraq Report (RFE/RL) - Recent reports in Iraq prepared by regional specialists of Radio Free Europe/Radio Liberty. Kurdistan.info - Information, news, analysis, and reports about Kurds and Kurdistan. Kurdistan Democratic Party (KDP) - Official site. Also see Wikipedia. Kurdistan Workers' Party (PRK) - Official site. Also see Wikipedia. Niquash - Briefings from inside and across Iraq. Patriotic Union of Kurdistan (PUK) - Official media site for PUK. People's Protection Units - In Kurdish: Yekîneyên Parastina Gel‎ or YPG, also known as People's Defense Units. The main armed service of the Kurdish Supreme Committee, the government of Syrian Kurdistan (Rojava). The YPG are primarily Kurdish, but also recruit Arabs, Israelis, Turks and westerners. There are also Assyrian/Syriac Christian units integrated into its command structure (Sutoro and Syriac Military Council). The YPG have become a major opponent of the Islamic State of Iraq and the Levant (ISIL). They have co-operated with Syrian opposition fighters against ISIL, but have avoided engaging forces of the Syrian government, which controls several non-Kurdish enclaves in Kurdish territory. Peshmerga - The military forces of the autonomous region of Iraqi Kurdistan. The overall formal head of the peshmerga is the President of Iraqi Kurdistan. The peshmerga force itself is largely divided and controlled separately by the Democratic Party of Kurdistan and Patriotic Union of Kurdistan, although both pledge allegiance to the Kurdistan Regional Government. Efforts are under way to gather the entire force under the Ministry of Peshmerga Affairs. Peshmerga forces are responsible for defending the land, people and institutions of the Kurdistan Region. Rudaw - News about Kurdistan - in English. RUSI - Information and analysis on Iraq. Secret Behind the Sanctions, The - How the U.S. intentionally destroyed Iraq's water supply. By Thomas J. Nagy. Published in The Progressive, Oct. 2001. U.S. Commercial Service in Iraq - Primary contact for U.S. exporters and Iraqi importers. UN Iraq - Works at the request of the government of Iraq to support national development efforts on political, electoral, and humanitarian levels. The UN advises and supports the government of Iraq and its people and works on capacity building to strengthen people and institutions during the democratic transition. UN Monitoring, Verification and Inspection Commission (UNMOVIC) - UNMOVIC was created through the adoption of Security Council resolution 1284 [.pdf] of 17 December 1999. UNMOVIC replaced the former UN Special Commission (UNSCOM) and continued with the latter's mandate to disarm Iraq of its weapons of mass destruction (chemical, biological weapons and missiles with a range of more than 150 km) and to operate a system of ongoing monitoring and verification to check Iraq's compliance with its obligations not to reacquire weapons prohibited to it by the Security Council. War Report - Select articles, documents, and analyses on the Iraq War compiled and frequently updated by the Project on Defense. Alternatives. +972 - Independent reporting and commentary from Israel and Palestine. A Jewish Voice for Peace - San Francisco Bay Area grassroots organization dedicated to the human, civil and economic rights of Jews, Palestinians, and all peoples in the Middle East. Adalah-NY - New York campaign for the boycott of Israel. Adalah-NY demands an immediate, unconditional, and permanent end to U.S. and U.S.-sponsored Israeli aggression in the Middle East. Addamer - A Palestinian non-governmental, civil institution which focuses on human rights issues. Offers support for Palestinian prisoners, advocating the rights of political prisoners, and working to end torture through monitoring, legal procedures and solidarity campaigns. Al Mezan Center for Human Rights - Protection for all human rights; particularly ESCR, in the Gaza Strip as part of OPT throughout research, legal intervention, advocacy and awareness. Al-Awda - Palestinian right to return coalition. Al Mezan Center for Human Rights - Promotes and protects human rights in the OPT and especially in the Gaza Strip with a focus on ESCR. Works for the realization of Palestinians' individual and collective human rights, including the right to self-determination through channels of international law. Al Shabaka - Palestinian policy network. Its mission is to educate and foster public debate on Palestinian human rights and self-determination within the framework of international law. Alaqsa Intifada - The Palestinian intifada: news, information, diary, and action alerts. Alternative Information Center (AIC) - A Palestinian-Israeli organization disseminating information, research and political analysis on Palestinian and Israeli societies as well as the Israeli-Palestinian conflict, while promoting cooperation between Palestinians and Israelis. American Muslims for Jerusalem - Formed to ensure that the concerns of the American Muslim community regarding Jerusalem and its environs are understood and respected in the formulation of U.S. policy. Americans for Peace Now (APN) - Sister organization of Shalom Achshav, Israel's preeminent peace movement. APN's mission is to educate and persuade the American public and its leadership to support and adopt policies that will lead to comprehensive, durable, Israeli-Palestinian and Israeli-Arab peace, based on a two-state solution, guaranteeing both peoples security, and consistent with U.S. national interests. Apartheid Wall (aka Israeli West Bank barrier) - Wikipedia backgrounder on the security and separation barrier under construction by the State of Israel along and within the West Bank. Upon completion, the barrier's total length will be approximately 700 kilometres (430 mi). Applied Research Institute Jerusalem - A non-profit organization dedicated to promoting sustainable development in the occupied Palestinian territories and the self-reliance of the Palestinian people through greater control over their natural resources. Arena of Speculation - The aim of this website is to build a collective platform to share original analysis, mappings, photographic studies and other projects that trace the contours of the spatial struggle in Israel-Palestine, and to support relevant events and actions, wherever they may occur. Arutz Sheva - Israeli national news. Association for One Democratic State in Palestine/Israel - Seeks a durable peace in Israel/Palestine through building a single democratic state for those who live in historical Palestine and all Palestinian refugees who desire to return to their homeland; democracy as the provision of universal human rights; a society in which no ethnic or religious group can dominate others; and reconciliation to heal the wounds of a troubled past. Promotes inter-ethnic understanding and solidarity through educational and cultural activities. B'tselem.org (Israeli Information Center for Human Rights in the Occupied Territories) - Documenting and educating the Israeli public and policymakers about human rights violations in the Occupied Territories. BADIL Resource Center on Palestinian Residency and Refugee Rights - Alternative, critical and progressive information and analysis on Palestinian refugees. Bidoun - Arts and culture from the Middle East. Bidoun's activities fall in three primary areas: publishing, educational, and curatorial, including curatorial initiatives, educational programs, artist commissions, talks, tours, performances, books, an itinerant library, and an online archive of avant-garde media. Breaking the Silence: Israeli Soldiers Talk About the Occupied Territories - Breaking the Silence is an organization of veteran Israeli soldiers working to raise awareness about the daily reality in the Occupied Territories. British Committee for the Universities of Palestine (BRICUP) - An organisation of UK-based academics, set up in response to the Palestinian Call for Academic Boycott. Oppose the continued illegal Israeli occupation of Palestinian lands with its concomitant breaches of international conventions of human rights, its refusal to accept UN resolutions or rulings of the International Court, and its persistent suppression of Palestinian academic freedom. Center for Palestine Studies (Middle East Institute, Columbia University) - Promotes the academic study of Palestine in all its forms. Offers a dedicated site for sustained interchanges among scholars and students. The Center's activities aim to advance the production and circulation of knowledge of Palestinian history, culture, society, and politics in diverse scholarly fields, including history, literary studies, the social sciences, religion, philosophy, law, archaeology, the arts, and architecture. Corporate Occupation - Tracking corporate complicity in the occupation of Palestine. Costs of the Israeli-Palestinian Conflict - This 2015 study by the RAND Corporation estimates the net costs and benefits over the next ten years of five alternative trajectories - a two-state solution, coordinated unilateral withdrawal, uncoordinated unilateral withdrawal, nonviolent resistance, and violent uprising - compared with the costs and benefits of a continuing impasse that evolves in accordance with present trends. The analysis focuses on economic costs related to the conflict, including the economic costs of security. In addition, intangible costs are briefly examined, and the costs of each scenario to the international community have been calculated. Days of Palestine - Daily news about Palestine. Defense for Children International Palestine (DCI) - A national section of the international non-governmental child rights organisation and movement, Defence for Children International (DCI). As such, it is a member of the International General Assembly of DCI, which convenes every three years. Currently, DCI has 45 national sections and associated members throughout the world, an international secretariat in Geneva and consultative status with the United Nations Economic and Social Council, UNICEF, UNESCO, and the Council of Europe. Developments in the Middle East Peace Process 1991-2000 - The UK House of Commons Library publishes this paper written by Tim Youngs providing background to events dating from the 1991 Madrid Conference to the July 2000 Camp David negotiations. Elements of a Performance-Based Road Map - UN page: "The following is performance-based and goal-driven roadmap, with clear phases, timelines, target dates, and benchmarks aiming at progress through reciprocal steps by the two parties in the political, security, economic, humanitarian, and institution-building fields, under the auspices of the Quartet. The destination is a final and comprehensive settlement of the Israel-Palestinian conflict by 2005, as presented in President Bush's speech of 24 June, and welcomed by the EU, Russia and the UN in the 16 July and 17 September Quartet Ministerial statements." Ezzedeen Al-Qassam Brigades - The armed branch of the Islamic Resistance Movement (Hamas). Foundation for Middle East Peace (FMEP)- Information and maps of Israeli settlements in occupied territory. The Report on Israeli Settlement in the Occupied Territories, published bimonthly by FMEP, provides up-to-date information on Israel's settlement policies as well as the ongoing negotations with the Palestinians over the future of the West Bank, Gaza Strip, and Jerusalem. Free Gaza - Human rights observers, aid workers, and journalists. Seeks to raise international awareness about the prison-like closure of the Gaza Strip and pressure the international community to review its sanctions policy and end its support for continued Israeli occupation. Gaza Strip - "In September 2005, Israel completed the" Gaza disengagement plan" that had been approved by the government and the Knesset. The two primary components of the plan were dismantling of the Gaza settlements and moving the settlers to Israeli territory, and removal of all IDF forces from the area. After the plan was completed, Israel issued an order declaring the end of the military government in the Gaza Strip, and claimed that it was no longer responsible for ensuring the proper functioning of life there. However, Israel continued to control the air and sea space, movement between the Gaza Strip and the West Bank (also via neighboring countries), the population registry, family unification, and the crossing of goods to and from Gaza. Also, residents of the Gaza Strip rely solely on Israel for its supply of fuel, electricity, and gas." Backgrounder from B'Tselem. Gaza Unlocked - Gaza Unlocked highlights the stories of how Palestinians in Gaza are affected by the blockade, as told in their own words. Gaza's Ark - A joint initiative by Palestinians in Gaza, including individuals from the Palestine Sailing Federation and the Fishermen's Solidarity Campaign among others, and international solidarity activists, including Free Gaza Australia, the Canadian Boat to Gaza, and Americans affiliated with the organizing committees for the US Boat to Gaza and the Gaza Freedom March. Gaza's Ark is part of the ongoing international Freedom Flotilla Coalitionchallenging the illegal and inhumane Israeli blockade of Gaza. George Habash (Aug 2, 1926-Jan 26, 2008) - Wikipedia article: Palestiniann nationalist. Founded the Popular Front for the Liberation of Palestine and was the organization's Secretary-General until 2000. Golan - Explains how the occupied Golan is a part of the Syrian Homeland, seized by Israel. Hamas (Islamic Resistance Movement) - Hamas is the Palestinian Sunni Islamic or Islamist political party that governs the Gaza Strip. Wikipedia provides information, history, and ideology of the organization. House Demolition in the Israeli-Palestinian Conflict - House demolition is a tactic used by the Israeli Defence Forces (IDF) against Palestinians in Jerusalem, the West Bank and the Gaza Strip and against Jewish communities such as Amona during the course of the Israeli-Palestinian conflict. Official IDF explanations for house demolitions include use as a counter-insurgency security measure to impede or halt militant operations, as a regulatory measure to enforce building codes and regulations, and as a deterrence against the resistance movement by punishing those suspected of aiding militants, and/or their families. A subject of considerable international controversy, human rights organizations have criticized the use of house demolitions by Israel as ineffective and a violation of international law, and have suggested that Israel's actual motivations are as a means of collective punishment against Palestinians and Israeli demographic objectives to seize property for the expansion of Israeli settlements. Human Rights Watch: Report on Israel and the Occupied Territories - HRW country report. Humanize Palestine - Attempting to restore the humanity that is often stripped away when Palestinians are reduced to calculative deaths, forgettable names, and burned and mutilated bodies, rather than people who shared loved ones, stories, dreams and aspirations. Honors the deceased as martyrs by bringing them back to life through their pictures, stories, art, and poetry. Institute for Research: Middle East Policy (IRmep) - A Washington-based nonprofit organization that studies U.S.-Middle East policy formulation. IRmep's Center for Policy & Law Enforcement examines how balanced and vigorous law enforcement can improve trade, economic development and America's international standing. IRmep's Israel Lobby Archive documents and provides citizen access to initiatives of one of the most harmful forces driving policy formulation in the U.S. political process. International Jewish Anti-Zionist Network (IJAN) - Committed is to the right of return for Palestinian refugees, the ending of the Israeli colonization of historic Palestine and an end to U.S. economic and military dominance in the region, in which Israel plays a crucial part. International Solidarity Movement - A Palestinian-led movement of Palestinian and International activists working to raise awareness of the struggle for Palestinian freedom and an end to Israeli occupation. Also see Wikipedia. Intifada: Voice of Palestine - Provides an alternative platform to dissect, highlight and broadcast stories of Palestinian global resistance movements, and struggles for freedom and justice in the Occupied Palestine territories and also those complicit in the crimes against the Palestinian people, that are underplayed or ignored by mainstream media. Israel Land Administration (ILA) - Over 93% of the land in Israel is public domain; that is, either property of the state, the Jewish National Fund (J.N.F) or the Development Authority. The ILA is the government agency responsible for managing this land which comprises 5,750,000 acres. "Ownership" of real estate in Israel usually means leasing rights from the ILA for 49 or 98 years. Israel-Lebanon Conflict - This page pulls together all the work done by Human Rights Watch on the conflicts between Israel, Lebanon and Hezbollah, including reports, news releases, a Q and A on the hostilities, and opinion articles. Israel/Palestine Center for Research and Information (IPCRI) - IPCRI is the only joint Palestinian-Israeli public policy think-tank in the world. It is devoted to developing practical solutions for the Israeli-Palestinian conflict. Israeli Committee Against House Demolitions (ICAHD) - Committed to building peace between Israelis and Palestinians by challenging discriminatory Israeli policies. Also see Wikipedia article on Jeff Halper, anthropologist, author, lecturer, political activist, and co-founder and Coordinator of ICAHD. Israeli Labor Party - A social democratic and Zionist political party in Israel. Israeli Ministry of Foreign Affairs - Official website. Law, government organization and structure, leaders and personalities, peace process, cultural news, economic news, religious information. Israeli Practices towards the Palestinian People and the Question of Apartheid (UN ESCWA, 10 Mar 2017) - Report published by the U.N.'s Economic and Social Commission for West Asia (UNESCWA). The report was removed from UNESCWA's website following pressure from the U.N. Secretary General. J Street - The political home for pro-Israel, pro-peace Americans fighting for the future of Israel as the democratic homeland of the Jewish people. Believes that Israel's Jewish and democratic character depend on a two-state solution, resulting in a Palestinian state living alongside Israel in peace and security. Jerusalem Fund, The - A Washington-based non-profit humanitarian organization. The Center is dedicated to the study and analysis of the relationship between the United States and the Middle East, with particular emphasis on Palestine and the Arab-Israeli conflict. Jerusalem Media and Communication Center (JMCC) - Breaking news and opinion on the Israeli-Palestinian Conflict. Jewish Political News and Updates - Gathers and reports politically-related news relevant to the greater Jewish community. Jewish Telegraphic Agency (JTA) - Provides extensive coverage of political, economic and social developments affecting Jews all over the world. Jewish Virtual Library - Comprehensive online Jewish encyclopedia. More than 6,000 articles and 2,000 photographs and maps have been integrated into the site. The Library has 13 wings: History, Women, The Holocaust, Travel, Israel and The States, Maps, Politics, Biography, Israel, Religion, Judaic Treasures of the Library of Congress, Vital Statistics and Reference. Each of these has numerous subcategories. Under Religion, for example, is the complete text of the Tanakh, information on Jewish holidays and material on relations between Jews and Christians and Muslims. The Politics wing includes collections on U.S.-Israel relations, the United Nations and the peace process. The Reference section has bibliographies of more than 1,000 books and 1,000 web sites, and a glossary of more than 1,000 words and a time-line for the history of Judaism. Jewish Voice for Peace (JVP) - National Jewish organization that provides a voice for Jews and allies who believe that peace in the Middle East will be achieved through justice and full equality for both Palestinians and Israelis. With offices in New York and California, 100,000 online activists, chapters across the country and an Advisory Board comprised of numerous prominent Jewish thinkers and artists, JVP supports nonviolent efforts here and in Israel-Palestine to end Israel's Occupation, expand human and civil rights, and implement a US policy based on international law and democracy. Jews Against Zionism - Dedicated to promoting the position of thousands of Jews who do not believe in the validity of a Jewish State of Israel. Jews for Peace in Palestine and Israel (JPPI) - A group of American Jews who believe that a just, comprehensive, and lasting peace in Palestine and Israel is attainable through negotiations based on international law and the implementation of relevant United Nations (UN) resolutions. Kerem Navot - An Israeli NGO established in 2012, which monitors and carries out research on Israeli land policy in the West Bank. Librarians and Archivists with Palestine (LAP) - A network of self-defined librarians, archivists, and information workers in solidarity with the Palestinian struggle for self-determination. Likud Party - The major center-right political party in Israel. Love Under Apartheid - Indigenous Palestinians have been living under Israeli military occupation for nearly 70 years now. These stories capture singular moments of love in struggle. Ma'an News Agency (MNA) - Source of independent news from Palestine. Meretz Party - A left-wing, social-democratic and Zionist political party in Israel. Mitchell Report - Full text of the 30 Apr 01 report of the Sharm el-Sheikh fact-finding committee, with recommendations on steps to take for Mideast peace. From the U.S. State Department. Occupation 101 - A powerful documentary film on the current and historical root causes of the Israeli-Palestinian conflict. Unlike any other film ever produced on the conflict -- 'Occupation 101' presents a comprehensive analysis of the facts and hidden truths surrounding the never ending controversy and dispels many of its long-perceived myths and misconceptions. Occupation Magazine - Established in October 2004 by a group of Israeli anti-occupation activists who were disturbed by the growing discrepancy between the grim reality which they observed in the Occupied Territories, and the way in which it was (and is) reported in the main stream media. The ongoing colonization policy in the Occupied Territories is being misrepresented by the Israeli and U.S. media as "fight against terror" and a "struggle for Israel's existence/security." In reality, colonization policies promote terror and endanger the future of both nations. Palestine Advocacy Project - An all-volunteer organization that creates public media and education campaigns that educates the world to the Palestinian struggle and advocates for an end to Israeli human rights abuses. Palestine Center - The educational program of the Jerusalem Fund, gives voice to the Palestinian narrative through policy briefings, lecture series, conferences, symposia, scholarly research publications and an extensive research library. The Center's analysis emphasizes a Palestinian perspective on the peace process, the Right of Return and final status negotiations, elections, international law, media coverage of Israel and Palestine and U.S. foreign policy in the region. Palestine Facts - Information on historical, military, and political background to the struggle between Israel and Palestinian Arabs. Palestine From My Eyes - Shahd Abusalama is a Palestinian artist, blogger and English literature student living in Gaza City, Palestine. She can be followed on Twitter at @shahdabusalama. Palestine Media Watch - Media watch group monitoring anti-Palestinian bias in U.S. news. Palestine Monitor - Commentary and analysis of the current situation in the Occupied Palestinian Territories; insights and views on Palestinian civil society. Palestine Remembered: The Home of All Ethnically Cleansed Palestinians - Creates a medium where refugees can communicate, organize, and share their experiences amongst themselves. Provides a comprehensive source of information about the villages and cities that were ethnically cleansed, looted, and destroyed by the Israeli army. Preserves the memories and the experiences of the Palestinian people around the world, especially the 726,000 Palestinians refugees who were ethnically cleansed from their homes, farms, and businesses as a result of the 1948 war. Palestinian Campaign for the Academic and Cultural Boycott of Israel - Launched in Ramallah in April 2004 by a group of Palestinian academics and intellectuals to join the growing international boycott movement. The Campaign built on the Palestinian call for a comprehensive economic, cultural and academic boycott of Israel issued in August 2002 and a statement made by Palestinian academics and intellectuals in the occupied territories and in the Diaspora calling for a boycott of Israeli academic institutions in October 2003. Palestinian Centre for Human Rights (PCHR) - A non-governmental organisation based in Gaza city dedicated to promoting human rights and democracy in Palestine. Palestine Chronicle - Provides daily news, commentary, features and book reviews on a variety of subjects, yet is largely focused on Palestine, the Arab-Israeli conflict and the Middle East as a whole. Palestine Facts - Dedicated to providing comprehensive and accurate information regarding the historical, military, and political background to the on-going struggle between the State of Israel and the Palestinian Arabs. Palestinian Information Center - News and information on Palestine. Palestine: Information with Provenance - Provides access to web-sites and on-line maps, articles, books, audio/video clips and films about Palestinian and Israeli societies as well as the Israeli-Palestinian conflict and ackgrounders on authors, speakers, journalists and broadcasters whose opinions you'll find here. Palestinian National Authority - The interim self-government body established in 1994 following the Gaza–Jericho Agreement to govern the Gaza Strip and Areas A and B of the West Bank, as a consequence of the 1993 Oslo Accords. Following elections in 2006 and the subsequent Gaza conflict between the Fatah and Hamas parties, its authority had extended only in areas A and B of the West Bank. Since January 2013, the Fatah-controlled Palestinian Authority uses the name "State of Palestine" on official documents. Palestinian Non-Governmental Organizations' Network (PNGO Network) - PNGO was established in September 1993, after the signing of the Oslo Accords, with the objective of enhancing coordination, consultation and cooperation among the different sectors of civil society. Since then PNGO has become an important component of Palestinian society and serves as an essential coordination mechanism for the NGO sector at the local, regional and international level. Palestine Liberation Organization Negotiations Affairs Department - An institution of the PLO that was established in 1994 in Gaza in order to follow up on the implementation of the Interim Agreement signed between Israel and the PLO. Palestine News Network (PNN) - A group of independent Palestinian journalists and editorseporting from a Palestinian perspective. Palestinian Hydrology Group - A Palestinian non-government organization striving to promote the role of women and civil societies in managing local water and its related environmental resources to ensure transparency, good water governance and just and equal provision of water and sanitation services to the rural and marginal communities in the West Bank and Gaza. Palestinian Refugee Researchnet - A non-partisan project devoted to the dissemination of ideas and scholarly information, in an effort to foster scholarly collaboration, policy research, and innovative thinking on the Palestinian refugee issue. Palestinian Return Centre - An independent academic/media consultancy founded and registered in the United Kingdom in 1996. It specializes in the research, analysis, and monitor of issues pertaining to the dispersed Palestinians and their right to return. It also serves as an information repository on other related aspects of the Palestine Question and the Arab-Israeli conflict. Pappe, Ilan - One of the "New Historians" who take a critical view of Zionist narratives and Israel's history. Pappe defends the Palestinian narrative and analysis of the events of the 1948 War. In particular he subscribes to the thesis that Palestinians were intentionally expelled by Yishuv and later Israeli forces in terms of a plan drawn up even before the war. Also may be found at Electronic Intifada. PASSIA (Palestinian Academic Society for the Study of International Affairs) - Seeks to present the Palestinian Question in its national, Arab and international contexts through academic research, dialogue and publication. Peace Now - Peace Now, the Israeli Peace Movement, was founded in 1978 by 348 reserve officers and soldiers of the Israel Defense Forces. The first and only mass peace movement in Israel, Peace Now rapidly became the single most important extra-parliamentary force for peace in the country, attracting hundreds of thousands to its mass rallies and activities. Permanent Observer Mission of Palestine to the United Nations - Information on issues related to Palestine and the United Nations, as well as information Palestinian affairs including, historical pieces and documents of the Middle East peace process. PLO Negotiations Affairs Department - Established in 1994 in Gaza in order to follow up on the implementation of the Interim Agreement signed between Israel and the PLO. Also see links to related sites. Popular Front for the Liberation of Palestine (PFLP) - A secular Palestinian Marxist–Leninist and revolutionary socialist organization founded in 1967 by George Habash. Believes PLO and PA is being and has been hijacked by a group who only represent a program of the Palestinian bourgeoisie. The Front also has reservations on some of Hamas’ policies, particularly those which ally itself with Qatar and Turkey as well as its failure to take a strong position against the U.S. and Saudi aggression on Yemen. Primer on Palestine, Israel and the Arab-Israeli Conflict - A MERIP publication. Prisoner Support and Human Rights Association - A Palestinian non-governmental, civil institution that works to support Palestinian political prisoners held in Israeli and Palestinian prisons. Raising Yousuf: A Diary of a Mother Under Occupation - Laila El-Haddad blog: "This blog is about raising my son Yousuf in the occupied Gaza Strip while working as a journalist, and everything that entails from potty training to border crossings. Together, we endure a lot, and the personal becomes political." Research Guide to the Palestinian-Israeli Conflict - Robin Miller. Russell Tribunal on Palestine (RToP) - An international people's tribunal created by a large group of citizens involved in the promotion of peace and justice in the Middle East. Saudi Initiative - Arab League Beirut Declaration of 28 March 2002. Tenet Plan - Israeli-Palestinian ceasefire and security plan, proposed by CIA Director George Tenet 13 Jun 01. From the Avalon Project at the Yale Law School. Third Way, The - Mitchell Plitnick's blogging on Israel-Palestine, the history of the conflict, the U.S.-Israel relationship, the different sectors of the peace movement, and many other related topics. Tikun Olam - Richard Silverstein's blog on the Israeli-Palestiniann conflict. Silverstein is a progressive (critical) Zionist. He supports Israeli withdrawal to pre-67 borders and an internationally guaranteed peace agreement with the Palestinians. True Torah Jews - Opposing Zionism. Two States One Homeland - The "two states, one homeland" initiative, was born from a series of meetings three years ago between Israeli journalist Meron Rapoport and Palestinian political activist Awni Almsni. This resulted in e foramtion of a group that today argues that Eretz Israel / Palestine be a shared homeland for two peoples -- the Jews and the Palestinians and that all those who live in this shared homeland should have equal rights to a life of liberty, equality and dignity, rights that must be guaranteed in any future settlement. UN Development Programme/Programme of Assistance to the Palestinian People (UNDP/PAPP) - Working in partnership with a number of donor countries, non-governmental and community organizations, as well as the Palestinian Authority, the UNDP/PAPP provides services and programs to the Palestinian people in development areas such as: rebuilding of Palestinian infrastructure, employment generation, local and rural development, poverty reduction, human development through education, environment, as well as crisis prevention and recovery. UN Interim Force in Lebanon (UNIFIL) - Created in 1978 to confirm Israeli withdrawal from Lebanon, restore the international peace and security, and help the Lebanese Government restore its effective authority in the area. UN Relief and Works Agency for Palestine Refugees in the Near East (UNRWA) - Feeding, housing, clothing, educating, and providing health care to Palestinian refugees. UN Resolutions on Palestine - Security Council Resolutions, General Assembly Resolutions, and resolutions of other UN Bodies. For full text of resolutions go to UNISPAL. Visualizing Palestine - Uses creative visuals to describe a factual rights-based narrative of Palestine/Israel. WAFA - News and information agency of the Palestinian National Authority. Welfare Association - Established in 1983 by a group of Palestinian business and intellectual figures to provide development and humanitarian assistance to Palestinians in the West Bank including Jerusalem, the Gaza Strip, 1948 Areas, and the Palestinian communities in Lebanon. Who Profits: The Israeli Occupation Industry - Israeli and international corporations are directly involved in the occupation: in the construction of Israeli colonies and infrastructure in the occupied territories, in the settlements' economy, in building walls and checkpoints, in the supply of specific equipment used in the control and repression of the civilian population under occupation. This database reflects an on-going grassroots investigation effort by activists in The Coalition of Women for Peace, a leading Israeli feminist peace organization, dedicated to ending the Israeli occupation of the West Bank, Gaza and the Golan Heights and reaching a just peace in Israel/ Palestine. In exposing companies and corporations involved in the occupation, it hopes to promote a change in public opinion and corporate policies, leading to an end to the occupation. Witness Gaza - Information about Israeli violence against the Palestinian people. Documents Israel's illegal blockade of Gaza and occupation of the West Bank. Wye River Memorandum - Full text of the 1998 Israeli-Palestinian agreement that lays out steps to facilitate the implementation of the Interim Agreement on the West Bank and Gaza Strip of September 28, 1995. From ArabicNews. Ynet News - The English-language sister-site to Ynet, Israel's largest news and content website. Youth Against Settlements - A national Palestinian non-partisan activist group which seeks to end Israeli colonial activities in Palestine (building and expanding settlements) through non-violent popular struggle and civil disobedience. Al Abdullah, Rania - Official site of Queen Rania, consort of King Abdullah II of Jordan. al-Akhbar - Features original content of opinion, analysis, and field stories as well as photo blogs chronicling the latest developments across the Middle East. Based in Lebanon. Al Mashriq: The Levant, Lebanon and the Middle East - Directory of cultural riches from the countries of the eastern Mediterranean. As Safir - A leading Arabic-language daily newspaper in Lebanon. Ending Syria's Occupation of Lebanon: The U.S. Role - An influential and 'hawkish' report released in May 2000 that called for using military force to disarm Syria of weapons of mass destruction (WMD) and to end its military presence in Lebanon. Among the signers are several senior members of the administration of President George W. Bush, including the chief Middle East aide on the National Security Council, Elliott Abrams; Undersecretary of Defence for Policy Douglas Feith; Undersecretary of State for Global Affairs Paula Dobriansky, and Michael Rubin and David Wurmser, senior consultants to both the State Department and the Pentagon on Iraq policy. Also signing were Richard Perle, the powerful former chairman of the Defence Policy Board (DPB); former United Nations ambassador Jeane Kirkpatrick; Frank Gaffney, a former Perle aide who heads the Center for Defence Policy; Michael Ledeen, another close Perle collaborator at the American Enterprise Institute (AEI); and David Steinmann, chairman of the Jewish Institute for National Security Affairs (JINSA). The study, Ending Syria's Occupation of Lebanon: The U.S. Role, was co-authored by Daniel Pipes, who has just been nominated by Bush to a post at the U.S. Institute of Peace (USIP), and Ziad Abdelnour, who heads a group founded by him called the United States Committee for a Free Lebanon (USCFL). The study was released by Pipes' group, the Middle East Forum. Hezbollah - A Shi'a Islamist militant group and political party based in Lebanon’s Shiite-dominated areas, including parts of Beirut, southern Lebanon, and the Bekaa Valley, an important farming region in the east. Islamic Resistance - Lebanon - Lebanese Hezbollah resistance site. Sheikh Sayyed Hassan Nasrallah is the leader of the Lebanese Hezbollah resistance movement. Nasrallah is considered one of the most powerful and charismatic figures in the Middle East. Under his leadership, Hezbollah became a serious opponent of the Israeli occupation. Naharnet - Lebanese news portal. Now Lebanon - Coverage and analysis of Lebanese issues and news. Al Alam - Middle East news. Tehran-based, covering developments in Iran, Iraq, Palestine, Lebanon and North Africa. Al Arabiya - English language news outlet controlled by members of the Saudi Royal family. Al Bawaba: The Middle East Gateway - Arab news, business and politics. al-Bab - Arab news, reference, and arts and culture. Al-Monitor - Dedicated to bringing in-depth coverage and fresh perspectives from the Middle East. Anna Baltzer: Witness in Palestine - Stories and photographs from a Jewish American's peacework documenting human rights abuses and supporting nonviolent direct action in the West Bank with the International Women's Peace Service. Cairo Review of Global Affairs - Quarterly journal of the School of Global Affairs and Public Policy (GAPP) at American University in Cairo. Its primary aim is to be a focal point for policymakers, officials, academics, experts, journalists, students and others in the Middle East region who follow global affairs. CNN: MIddle East - CNN news coverage of current events in the Middle East. EA WorldView - Daily news and analysis about Syria, Iran, the wider Middle East, US and Russian foreign policy. Gideon Levy - Israeli journalist and editor for the Haaretz newspaper and outspoken opponent of Israel's policies in the occupied West Bank. Karl reMarks - Blogging on Middle East politics, culture and satire. Levant Report - A grassroots network of Texas professionals who are deeply alarmed by what Washington is doing in the Middle East. Ma'an News Agency - Ma'an means 'together' in Arabic. It is a Palestinian on-line news agency that publishes up-to-the-minute news in Arabic, English, and Hebrew. Marc Lynch - Marc Lynch is associate professor of political science and international affairs at George Washington University, where he is the director of the Institute for Middle East Studies. He is also a non-resident senior fellow at the Center for a New American Security. He publishes frequently on the politics of the Middle East, with a particular focus on the Arab media and information technology, Iraq, Jordan, Egypt, and Islamist movements. Middle East Journal - Provides original and objective analysis, as well as source material, on the area from Morocco to Pakistan and including Central Asia. Published quarterly for over 50 years by the Middle East Institute. Middle East Live - Guardian/UK coverage of Middle East and North Africa. Middle East Media Research Institute (MEMRI) - Explores the Middle East and South Asia through their media. MEMRI bridges the language gap between the West and the Middle East and South Asia, providing timely translations of Arabic, Farsi, Urdu-Pashtu and Dari media, as well as original analysis of political, ideological, intellectual, social, cultural, and religious trends. Middle East News Agency (MENA) - An Internet service gives its subscribers a real-time news service covering regional and international news. Middle East Peace Process - In-depth reporting, archives, interactive maps, and additional resources and links from the New York Times. Middle East Research and Information Project (MERIP) - MERIP provides news and perspectives about the Middle East not available from mainstream news sources. The magazine has developed a reputation for independent analysis of events and developments in the Middle East. Middle East Review of International Affairs (MERIA) - MERIA is a project owned and edited by Prof. Barry Rubin. It is produced in conjunction with the Begin-Sadat Center for Strategic Studies. Its goal is to advance research on the Middle East and foster scholarly communication and cooperation. Middle East Transparent - News service. Mondoweiss - A news website devoted to covering American foreign policy in the Middle East, chiefly from a progressive Jewish perspective. Omar Badder - Political scientist, human rights activist, and new media professional based in Washington, DC. Badder travels to the Middle East on a biennial basis, and participates in dozens of panels, lectures, and debates on college and university campuses throughout the U.S. on conflicts in the Middle East and on U.S. policy towards the region. Scoop Empire - Urban online hub for all that is new, hip, enticing and funk in the Middle East. Shia Post, The - Shiite news portal. Tuqay, The - News coooperative covering: Balkans, Turkey, Caucasus, Iran, Central Asia, and South Asia. Washington Report on Middle Eastern Affairs - A 140-page magazine published 10 times per year in Washington, DC, that focuses on news and analysis from and about the Middle East and U.S. policy in that region. Your Middle East - News, analysis, and in-depth reporting on issues relating to the Middle East and North Africa. Americans for Middle East Understanding (AMEU) - Publishes The Link, a bi-monthly publication challenging prevailing myths and stereotypes about Arabs, Muslims and the Israeli-Palestinian conflict. Also see glossary for references to the Arab World, Islam, the Holy Land and, most particularly, the Israeli-Palestinian conflict. Amnesty International: Middle East & North Africa Human Rights - AI fact finding missions, updates, and annual reports on the state of human rights in Middle East and North Africa. Arab League - Established in 1945. It has 22 members: Algeria, Bahrain, Comoros, Djibouti, Egypt, Iraq, Jordan, Kuwait, Lebanon, Libya, Mauritania, Morocco, Oman, Palestine, Qatar, Saudi Arabia, Somalia, Sudan, Syria, Tunisia, United Arab Emirates, and Yemen. Brookings Institution: The Saban Center for Middle East Policy - Draws on a diverse staff with expertise in such issues as regime change and nation building in Iraq, Palestinian-Israeli peace, and U.S. relations with the Islamic world. As an integral part of the Foreign Policy Studies program, the Center provides a forum for all Brookings scholars engaged in Middle East-related research. Bureau of Near Eastern Affairs (NEA) - News, transcripts, official statements, and speeches provided by the U.S. State Department. Deals with U.S. foreign policy and U.S. diplomatic relations with Algeria, Bahrain, Egypt, Iran, Iraq, Israel, Jordan, Kuwait, Lebanon, Libya, Morocco, Oman, Palestinian Territories, Qatar, Saudi Arabia, Syria, Tunisia, United Arab Emirates, and Yemen. Also see Middle East Digest which provides text and audio from the U.S. State Department's Daily Press Briefing. Council for the National Interest (CNI) - Provides information and analysis on the Middle East and U.S. policy formation in the region. CSIS Middle East Program - Research and published analysis on U.S. policy toward the Middle East. European Association of Middle East Studies (Eurames) - Eurames is an association of national scholarly societies for Middle Eastern studies, which each carries out extensive networking and research-related activities. Gulf Organization for Industrial Consulting (GOIC) - Founded in 1976 by the Gulf Cooperation Council (GCC) member states: The United Arab Emirates, Bahrain, Saudi Arabia, Oman, Qatar and Kuwait, and in 2009, Yemen joined the Organization. Founded to achieve industrial cooperation and coordination between member states. In order to do so, it collects and disseminates information about industrial development projects and policies. GOIC also offers specific suggestions aiming at establishing joint industrial projects between member states and delivers recommendations to reconcile industrial development projects. Institute for Middle East Understanding (IMEU) - Offers journalists and editors quick access to information about Palestine and the Palestinians, as well as expert sources - both in the U.S. and in the Middle East. International Middle East Media Center (IMEMC) - A media center developed in collaboration between Palestinian and International journalists to provide an English language media coverage of Israel-Palestine. Middle East Observatory - A geopolitical study and research center based in Montreal, Canada, covering the Middle East. Middle East Outreach Council (MEOC) - A national nonprofit organization working to increase public knowledge about the peoples, places, and cultures of the Middle East, including the Arab world, Israel, Iran, Turkey, and Afghanistan. Middle East Policy Council - Political analysis of issues involving the greater Middle East. Middle East Studies Association (MESA) - MESA is a private, non-profit, non-political learned society that brings together scholars, educators and those interested in the study of the region from all over the world. From its inception in 1966 with 50 founding members, MESA has increased its membership to more than 2,600 and now serves as an umbrella organization for more than sixty institutional members and thirty-nine affiliated organizations. The association is a constituent society of the American Council of Learned Societies, the National Council of Area Studies Associations, and a member of the National Humanities Alliance. As part of its goal to advance learning, facilitate communication and promote cooperation, MESA sponsors an annual meeting that is a leading international forum for scholarship, intellectual exchange and pedagogical innovation. It is responsible for the International Journal of Middle East Studies, the premiere journal on the region, the MESA Bulletin and a quarterly newsletter. An awards program recognizes scholarly achievement, service to the profession and exemplary student mentoring. Middle East Studies Program - Downloadable reports and briefings analyzing a wide range of strategic issues in the Middle East. Provided by the Center for Strategic and International Studies (CSIS). MIFTAH: The Palestinian Intiative for the Promotion of Global Dialogue and Democracy - Miftah's underlying premise is the integration of several processes: Palestinian nation-building and empowerment on the basis of the principles of democracy, human rights, rule of law, and participatory governance; international reconciliation and cooperation; the gathering and dissemination of information and the active participation in the global dialogue as an equal partner. Project on Middle East Democracy (POMED) - Examines how genuine democracies can develop in the Middle East and how the U.S. might best support that process. Saban Center for Middle East Policy - Draws upon Brookings Institution staff with expertise in such issues as regime change and nation building in Iraq, Palestinian-Israeli peace, and U.S. Relations with the Islamic World. The Center provides a forum for all Brookings scholars engaged in Middle East-related research. Southwest Initiative for the Study of Middle East Conflicts - A consortium of instructors, researchers and students based at The University of Arizona, dedicated to furthering understanding of conflict in the greater Middle East and Northern Africa through curriculum development, advanced research, diverse partnerships and community outreach. Tahrir Institute for Middle East Policy - Dedicated to understanding and supporting Middle Eastern countries undergoing democratic transitions and committed to informing U.S. policymakers and the public of developments in these countries. U.S. Department of State: Bureau of Near Eastern Affairs - Deals with U.S. foreign policy and U.S. diplomatic relations with the countries in the Near East and North Africa regions. Washington Institute for Near East Policy - Pro-Israel think tank devoted to maintaining and strengthening the US-Israel alliance through advocacy in the media and lobbying the executive branch. WINEP's founding director, Martin Indyk, was previously research director of AIPAC which, then as now, focuses most of its efforts on Congress. Avalon Project: The Middle East 1916-2001 - A documentary record (Yale Law School). Country Reports - Background information on economy, defense, geography, government, history, and people for Middle Eastern countries and other countries throughout the rest of the world. International Studies - Middle East - Resources from the Air War College. Lonely Planet: Middle East - Travel guide to the Middle East. Major Oil Companies Operating in the Gulf Region - Organized by country. Compiled by Eric V. Thompson. Middle East Books - Bibliography, searchable database of Middle East books. Middle East Children's Alliance (MECA) - A non-governmental organization, working for peace and justice in the Middle East; focusing on Palestine, Israel, Lebanon and Iraq. Focuses on human rights of people in the region and especially on the rights of children. Middle East Conflict - David Masci article from the April 06, 2001 issue of The CQ Researcher. Middle East Directory - A comprehensive guide to Middle East websites and Internet-related services in United Arab Emirates and the Middle East. Middle East Eye - Portal for news in the Middle East. 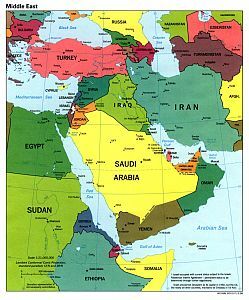 Middle East History and References - History and documents related to the Mid-East and the Palestine-Israel Conflict. Middle East Photograph Archive - The Middle East Department of the University of Chicago Library maintains this archive of early photographs of the Middle East. Middle East Studies Internet Resources - Columbia University's collection of Middle East Studies Internet Resources is an on-going compilation of electronic bibliographic resources and research materials on the Middle East and North Africa. Middle Eastern Studies Guide - This guide serves as a portal for resources for Middle Eastern, Armenian and Central Asian Studies. It contains links to a wide variety of e-resources, including reference sources like online encyclopedias and bibliographies; databases and indexes; e-book and journal collections; and news, cultural, and governmental sites. Please note that while some electronic resources are freely available, others are subscription services provided by the UCLA Library, so remote access may be necessary when accessing from off-campus. MidEast Web GateWay - Portal. Near East South Asia Center for Strategic Studies - Established by the U.S. Secretary of Defense to provide an academic forum for the discussion of security issues in the NESA region. Gulf Times - Daily newspaper published in Doha, Qatar. National Human Rights Committee (NHRC) - Works for the protection and promotion of human rights for everyone subject to the jurisdiction of the state of Qatar (citizens, residents and transit travelers). Qatar-Info - Quarterly magazine, plus practical information and resources on Qatar. History of Syria - Wikipedia backgrounder. National Coalition for Syrian Revolutionary and Opposition Forces - Commonly named the Syrian National Coalition. A coalition of opposition groups in the Syrian civil war that was founded in Doha, Qatar, in November 2012. Former imam of the Umayyad Mosque in Damascus, Moaz al-Khatib, considered a moderate, is its elected president. New York Times: Syria - Recent developments, news of Syria from the NYT. Syria Comment - Joshua Landis' blog on Syrian politics, history and religion. Syria Connect - Aggregated news. Syria Deeply - News site dedicated to the Syria crisis. Syrian Arab News Agency (SANA) - The national official news agency in Syria. It was established in 1965. It is linked to the Ministry of Information and has its headquarters in Damascus. Independent International Commission of Inquiry on the Syrian Arab Republic - Established on 22 August 2011 by the UN's Human Rights Council through resolution S-17/1 adopted at its 17th special session with a mandate to investigate all alleged violations of international human rights law since March 2011 in the Syrian Arab Republic. Local Coordinating Committees of Syria (LCCSyria) - Consists of a network of local groups that organise and report on protests as part of the Syrian uprising. National Coalition for Syrian Revolutionary and Opposition Forces - A coalition of opposition groups in the Syrian civil war that was founded in Doha, Qatar in November 2012. Former imam of the Umayyad Mosque in Damascus, Moaz al-Khatib, considered a moderate, was elected the president of the coalition. Riad Seif and Suheir Atassi, both prominent democracy activists and the latter a secular feminist, were elected vice presidents. Violations Documentation Center in Syria VDC - Opposition group documenting alleged acts of violations of human rights, including political arrests, violations committed against journalists, imprisonments without trial, travel bans, forced exiles, deprivation of Syrian nationality, torture and killings by the Syrian Arab Republic. Industrial Relations in Turkey (IRT) - Collects data and news about both labor and employers organisations in Turkey. Marxist-Leninist Communist Party Turkey - Plays a leading role in uniting, politicising and organising the working class and labouring masses in the struggle for freedom and socialism in order to put an end to capitalism. Anadolu Agency - Official news agency (i.e., propaganda arm) of Turkey. Daily Sabah - Daily news from Turkey. EbruNews - News and analysis. Hurriyet Daily News - News. JINHA News Agency - News written by and about women and women's issues. Based in Diyarbakır, Turkey. Turkish Sun, The - A daily English-language online newspaper offering a signature mix of news reporting and commentary on politics, international affairs, economics, popular culture, sports and the arts, science and technology, and business. World Bulletin: Turkey - Turkey and world news from Istanbul. Taksim Dayanışmasi - Turkish resistance group working to see that Taksim Gezi Park is not re-developed under the name of Artillery Barracks or any other project. UCB Libraries: Turkey - Resources. National, The - English-language news on the Middle East from Abu Dhabi Media company. UAE Interact - Portal providing over 50,000 pages of news and information on the UAE. United Nations OCHA Yemen Country Office - OCHA Yemen's main role is to help the UN Humanitarian Coordinator and the Humanitarian Country Team to coordinate the response to the country's humanitarian crisis. The team facilitates strategic response planning and manages the Yemen Humanitarian Response Plan (YHRP), ensuring that humanitarian action is coordinated and based on humanitarian principles. So You Think You've Seen Yemen? - Photo album sharing the hidden beauty of Yemen. Yemen News Agency (SABA) - Official news agency of the Republic of the Yemen. Yemen Post - Best of content from the main Yemen Post newspaper, and up to the minute breaking news from around Yemen, the Gulf region and the Middle East. World Health Organization (WHO): Yemen - The WHO country health profile of Yemen provides key statistics and links to health topical databases, plus news, features and Bulletin journal articles on the health issues of Yemen. This webpage last updated on Tuesday, February 19, 2019 4:32 PM.